To assess vision-related quality of life and military readiness and capabilities among active duty U.S. military service members undergoing refractive surgery. In this prospective, single-center, observational study, active duty U.S. military service members electing to undergo refractive surgery were asked to complete a military performance questionnaire and the National Eye Institute Refractive Error Quality of Life Instrument (NEI RQL-42) preoperatively and at 6 months postoperatively. 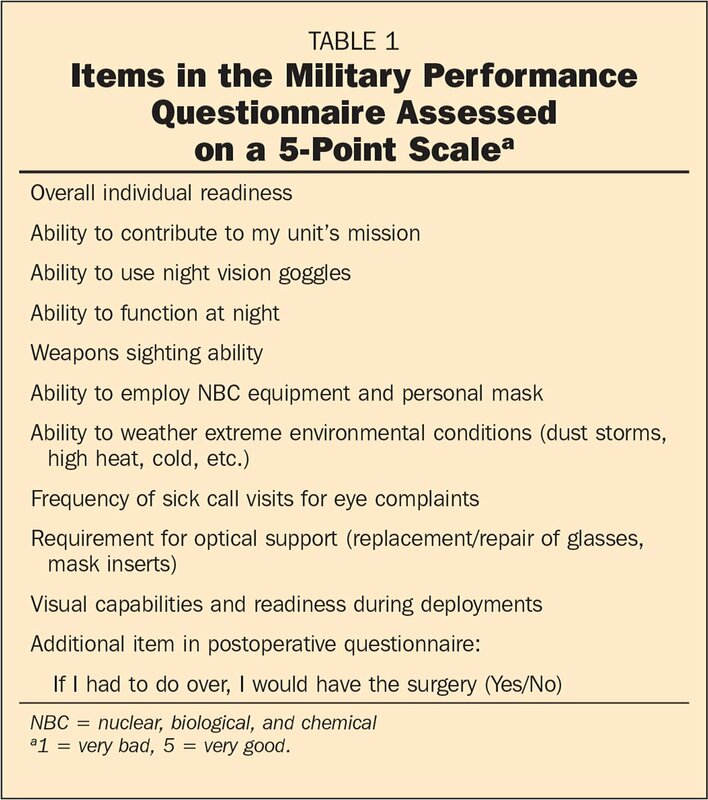 On the military performance questionnaire, participants rated (1 = very bad to 5 = very good) how they felt their vision affected their military readiness and capabilities after refractive surgery. Among 360 participants at 6 months postoperatively, the overall mean military performance score increased from 3.6 ± 0.8 to 4.8 ± 0.3, a change of 1.2, with 91.7% of the participants indicating an overall improvement in readiness and capability (P < .001). Scores measuring overall individual readiness, contribution to unit's mission, use of night vision goggles, function at night, weapons sighting ability, employment of personal masks, weather extreme environmental conditions, and optical support were significantly higher postoperatively (P < .001). For the NEI RQL-42, scores were significantly higher postoperatively for the subscales clarity of vision, expectations, near vision, far vision, diurnal fluctuations, activity limit, glare, dependence on correction, worry, appearance, and satisfaction with correction (all P < .001), but not for symptoms after refractive surgery (P = .403). Refractive surgery significantly improves military readiness and capabilities and vision-related quality of life of active duty U.S. military service members with refractive error. Traditional clinical tests such as uncorrected and corrected visual acuities and manifest refraction are commonly used to obtain benchmarks for safety, efficacy, and the overall success of refractive surgery. Although these are the primary considerations in standardized reporting of outcomes, clinicians and researchers alike have acknowledged the importance of supplementing these tests with patient-reported outcomes to render a complete assessment of the treatment performed.1–3 Tools for patient-reported outcomes such as quality of life questionnaires may be able to capture and monitor visual performance following surgery, which may not show up in conventional clinical tests, such as difficulties while performing common activities such as reading and driving. For those in the military, the impact of refractive surgery may also be reflected in their perceived ability to perform occupation-specific tasks. In fact, the U.S military adopted the Warfighter Refractive Eye Surgery Program for eligible active duty service members because it recognized the potential benefits of refractive surgery in enhancing the readiness and effectiveness of individual service members and their military units. Although the safety and efficacy of refractive surgery have been widely demonstrated through standard clinical assessments in military and civilian population reports, studies on occupation-specific quality of life, satisfaction, and performance4–8 are relatively limited. Military service members are most likely to be subjected to unique visual demands, especially during military operations occurring in varying low light conditions, adverse environmental conditions, or even in critical situations calling for instantaneous life and death decisions. Therefore, additional evaluation could provide further insight into the effect of refractive surgery on their subjective visual function and performance. In this study, we assessed the perception of active duty U.S. military service members undergoing refractive surgery on their vision-related quality of life and military readiness and capabilities. The study was conducted at the Warfigher Refractive Eye Surgery Program and Research Center (WRESPRC), Fort Belvoir Community Hospital, Fort Belvoir, Virginia. The protocol was reviewed and approved by the institutional review board at Walter Reed National Military Medical Center, Bethesda, Maryland, prior to study initiation. Active duty U.S. military service members who were at least 21 years old, with either myopia or hyperopia, with or without astigmatism, undergoing primary refractive surgery at WRESP-RC were included in the study. A key exclusionary criterion was a previous intraocular or corneal surgery in either eye. Written informed consent was obtained from each participant before any study procedure was administered. Enrolled participants were asked to complete a questionnaire adapted from the U.S. Army Refractive Surgery questionnaire8 preoperatively and at 6 months postoperatively. On a 5-point scale (1 = very bad, 5 = very good), the participants were asked how they felt their vision affected their military readiness and capabilities. One additional item in the postoperative questionnaire was to rate their satisfaction with the refractive surgery (Table 1). An initial assessment of the validity and reliability of the military questionnaire was performed on the first 100 of 360 enrolled participants. To evaluate test–retest reliability, the questionnaire was administered twice preoperatively and then twice at 6 months postoperatively. The time interval for the first and second completion of the questionnaire ranged from 7 to 30 days. In addition to the military performance questionnaire, the National Eye Institute Refractive Error Quality of Life Instrument (NEI RQL-42)9,10 was administered to the remaining 260 of the 360 participants preoperatively and at 6 months postoperatively. At the time of the study, the refractive surgery procedures available at the study site included photorefractive keratectomy (PRK), LASIK, and phakic intraocular lens (IOL) implantation. In PRK, corneal epithelial debridement was performed using the Amoils brush scrubber (Innovative Excimer Solutions, Inc., Toronto, Ontario, Canada). Prophylactic mitomycin C was applied according to individual parameters set by the surgeons. In LASIK, a superior-hinged corneal flap was created using the iFS Intra-Lase femtosecond laser (Johnson & Johnson Vision, Jacksonville, FL). All photoablative procedures were performed using the WaveLight Allegretto Wave Eye-Q excimer laser (Alcon Laboratories, Inc., Fort Worth, TX). A posterior chamber Visian Implantable Collamer Lens (ICL; STAAR Surgical, Monrovia, CA) was used in phakic IOL surgery. The statistical analysis was performed using SPSS software (version 21; IBM Corporation, Armonk, NY). The internal consistency of the military performance questionnaire items was measured by Cronbach's alpha. The test–retest reliability was assessed by estimating the intraclass correlation coefficient for the overall score. Criterion validity was evaluated by calculating the Pearson correlation coefficients between each questionnaire item and clinical variables including manifest spherical equivalent (MSE) and corrected distance visual acuity (CDVA) of the better eye. The NEI RQL-42 responses were recoded as scores ranging from 0% to 100%, with higher scores indicating better quality of life.11 The averages for items within each scale were calculated to determine the scores for the 13 scales of the NEI RQL-42: clarity of vision, expectations, near vision, far vision, diurnal fluctuations, activity limitations, glare, symptoms, dependence on correction, worry, suboptimal correction, appearance, and satisfaction with correction. The Wilcoxon signed-ranked test was used to compare preoperative to postoperative individual military performance item scores and overall mean scores, as well as the scores for each NEI RQL-42 scale. A P value of less than .05 was considered statistically significant. The study comprised 360 participants, aged 29.6 ± 7.2 years (range: 21 to 55 years), most of whom were male (328, 91.1%). The participants had mean manifest sphere of −2.60 ± 1.92 diopters (D), cylinder of −0.74 ± 0.66 D, and MSE of −2.97 ± 1.86 D. Almost all of the participants (359, 99.7%) had CDVA of 20/20 or better in at least one eye. A total of 241 (66.9%) participants underwent PRK, 115 (31.9%) underwent LASIK, and 1 (0.3%) underwent phakic IOL implantation. Three participants were not treated. Removing the items for frequency of sick call visits and visual capabilities and readiness during prior deployments due to low response rate, the internal consistency of the 8-item preoperative scale was high for the first and second administration of the questionnaire (Cronbach's alpha 0.889 and 0.876, respectively). The test–retest reliability of the overall mean score was modest preoperatively and postoperatively (intraclass correlation coefficient = 0.57 and 0.70, respectively). Table 2 shows the association between questionnaire items and clinical measures including CDVA and MSE. The overall mean score and the items on overall individual readiness, ability to contribute to the unit's mission, and ability to weather extreme environmental conditions showed a significant but weak correlation to CDVA (P < .05). All participants (n = 360) completed the preoperative questionnaire, whereas 169 of them completed the postoperative questionnaire. There was a significant improvement in all of the 8 questions and the overall mean score (P < .001). The overall mean scores increased from 3.6 ± 0.8 to 4.8 ± 0.3, a change of 1.2, with 91.7% of the participants indicating an overall improvement in performance. The median scores for each questionnaire item are shown in Table 3 and the proportion of the participants who had better, worse, or no change in scores are presented in Figure 1. Of the 27 participants who were deployed after refractive surgery, 21 (77.8%) of them reported improved visual capabilities and readiness compared to prior deployment before surgery. When asked if they had to do it again, 167 of 169 (98.8%) of the respondents would have the surgery again. Proportion of the participants who had better, worse, or no change in military performance scores. A significant improvement in NEI RQL-42 scores from preoperative baseline were observed in NEI RQL-42 scales clarity of vision, expectations, near vision, far vision, diurnal fluctuations, activity limitations, glare, and dependence on correction (P < .001). There was no significant difference in symptoms such as discomfort, dryness, tearing, itching, or soreness after refractive surgery (P = .403). The mean scores and proportions of the participants who reported improvement are shown in Table 4. Refractive surgery offers potential operational benefits over corrective lenses for service members with refractive error. Optical correction with eyeglasses in a combat environment has significant disadvantages because dust, sweat, and other substances may accumulate on lenses. Eyeglasses can also interfere with protective masks, specialized headgear, and vision augmentation devices, whereas optical inserts for ballistic eyewear can also become fogged, scratched, broken, or lost. Contact lenses could eliminate concerns inherent to eyeglasses; however, contact lenses are prohibited during deployments due to issues associated with lens overwear, poor hygienic conditions, and increased risk of infections. For these reasons, refractive surgery has been made available to eligible active duty military service members as a readiness option for vision enhancement. The general perception among service members on their capabilities and readiness after receiving refractive surgery seems to be consistent with previous findings. The current findings were similar to the results of a survey performed on soldiers returning from deployment in Afghanistan, Iraq, or Kuwait after the first few years (2000–2003) of implementing the U.S. Army Warfighter Refractive Eye Surgery Program. Hammond et al.8 reported that among 175 soldiers who completed a post-deployment questionnaire, 93.1% felt the surgery enhanced their ability to contribute to their unit's mission and 93.7% felt their overall individual readiness was better or much better after surgery. Likewise, in a study by Tanzer et al.7 on naval aviators undergoing LASIK, 292 of 305 (95.8%) participants felt that LASIK had helped their effectiveness as naval aviators. The perceived gains from refractive surgery could be further demonstrated in this study by the responses of service members regarding vision-related quality of life. 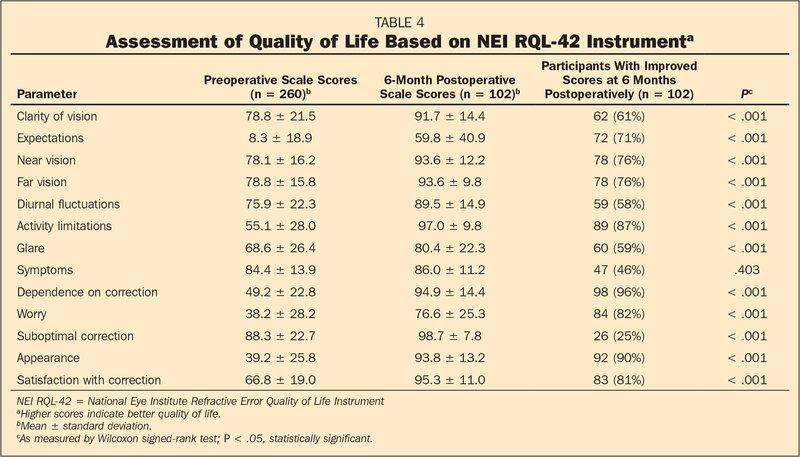 Quality of life was significantly improved postoperatively based on a higher average of overall NEI RQL-42 scores postoperatively. Clarity of vision, expectations, near vision, far vision, diurnal fluctuations, activity limitations, glare, dependence on correction, worry, suboptimal correction, and appearance were also better postoperatively. Symptoms that assessed discomfort, dryness, tearing, itching, or soreness, if experienced at all, did not show a significant change from preoperative baseline. Although our study was not limited to LASIK, the results of the NEI RQL-42 reinforced earlier findings of the U.S. Food and Drug Administration-initiated Patient-Reported Outcomes With LASIK (PROWL) studies.1 In both the PROWL-1 and PROWL-2 studies, which comprised active duty U.S. Navy personnel and civilians, respectively, the investigators found only a few participants developed dry eye symptoms based on their Ocular Surface Disease Index scores. In terms of visual symptoms such as double images, glare, halos, and starbursts, the PROWL studies also found that the overall prevalence of visual symptoms decreased. Although the investigators found that there was a large percentage of participants without visual symptoms preoperatively who developed visual symptoms postoperatively, only a few participants reported a substantial impact from the symptoms and that less than 1% of PROWL-1 participants had difficulty performing usual activities due to visual symptoms. It may be argued that the high satisfaction rate could be driven by the fact that the surgery has no monetary cost to military personnel, so they might be less critical compared to a civilian patient who would be spending several thousand dollars for surgery. Although it would seem that meeting financial expectations may be more relevant when referring to the satisfaction of paying patients, it should be pointed out that refractive surgery for military personnel is not cost-free. Under the WRESP, refractive surgery is considered a military readiness enhancement rather than a cosmetic procedure. For example, in the Army, combat arms and deploying soldiers regardless of specialty are given highest priority. As Pasquali et al.5 suggested, satisfaction is multidimensional and is also dependent on whether the physical and emotional expectations are met. For example, physicians who may tend to be more skeptical of and objective about refractive surgery also responded positively, with a 95.8% total satisfaction rate.5 Furthermore, McGhee et al.16 found improved unaided vision ranked highest for motivation for refractive surgery but offered that although patients may be satisfied with the surgery overall, they may not necessarily be satisfied with subcomponents of outcomes. In our study, we demonstrated that there are physical and emotional advantages of refractive surgery from the military personnel standpoint as seen in the improved scores postoperatively, especially when asked about a specific visual task or requirement (Figure 1). However, it is also worth noting that there was a cohort of respondents whose scores were unchanged postoperatively when asked about their overall individual readiness and ability to contribute to their unit's mission. On further assessment, of the 70 respondents whose scores were unchanged when asked about overall individual readiness postoperatively, 62 (88.6%) had already given their preoperative readiness a score of 5 (very good) and the remaining 8 (11.4%) had given a score of 4 (good). Similarly, of those whose scores were unchanged when asked about ability to contribute to unit's mission, 87 (94.6%) had ranked their preoperative ability as 5 (very good) and the remaining 5 (5.4%) respondents ranked their readiness as 4 (good). We also found a small percentage had worse scores: 1.8% for overall individual readiness, 4.1% for contribute to unit's mission, 0% for use of night vision goggles, 7.2% for function at night, 0.8% for weapons sighting ability, 0.9% for employment of nuclear, biological, and chemical equipment, 3.9% for weather extreme environmental conditions, and 6.3% for optical support in theater. Among 24 participants who had worse scores in at least one of these specific tasks or requirements, 16 had PRK and 8 had LASIK. They did not appear to be procedure dependent because these numbers represented 15% and 13.1% of total respondents after PRK and LASIK, respectively. All participants, except for one who had LASIK, would undergo surgery if asked to do it over. The current study was limited primarily by a low follow-up response rate. All of our participants completed the questionnaires at baseline and, despite appropriate efforts including allotting a ±1 month follow-up period, slightly more than half (52.7%) of them were unable to accomplish the questionnaire at their 6-month postoperative timeframe. The drawback was most likely due to the study participants' “nature of work.” Although participants were offered options to complete the questionnaires off-site, different job requirements such as deployments and training exercises might have precluded them from doing so on time. Miller and Aharoni17 also identified other factors for nonresponse in military surveys, including technological and situational barriers such as computer access issues, junk-mail settings, perceptions of privacy and anonymity, and motivational factors such as perceived lack of time, incentive, feedback, interest on topic, survey length, and survey fatigue.17 Considering active duty service members are generally deployable at least 90 days following refractive surgery, the study was still able to obtain a sizeable number of responses at 6 months postoperatively. Assessing for potential nonresponse bias, the study did not find a significant difference in refractive error or PRK/LASIK proportion between postoperative respondents versus nonrespondents. However, the study did find that the participants who were unable to complete the follow-up questionnaires tended to be younger compared to those who did. This observation is not uncommon in surveys involving U.S. military personnel. For example, in a 2012 survey performed on U.S. Air Force military personnel on the role of information and communications technologies on airmen's social and psychological well-being, airmen in the youngest age group (18 to 24 years) were the least likely to respond.17 Although disproportionate responses among age groups could be a cause for concern to some degree because the younger age group may be underrepresented, Miller and Aharoni explained that nonresponse bias would be present only when respondents and nonrespondents would have answered differently and that the difference in characteristics would be relevant to the study.17 In the current study, we did not find significant differences in the score for military readiness and capabilities between respondents and nonrespondents in either the younger (< 30 years) or older (30 and older) study population. Moreover, in both respondents and nonrespondents, we did not find significant differences in the scores for the same outcome measures between the younger and older subgroups. Participants were also enrolled consecutively irrespective of the surgery planned. Because PRK and LASIK were the predominant procedures, a further limitation of the study was that no data could be derived to determine whether there were any variations in outcomes following laser refractive surgery procedures compared to outcomes following phakic IOL implantation. If not eligible for refractive surgery otherwise, phakic IOL implantation is a generally accepted alternative among military refractive surgeons, although there are service-specific restrictions. Exploratory analysis revealed no significant differences in the postoperative military readiness and capabilities scores of those who had PRK compared to those who had LASIK (P > .092). The findings of this study offer additional insight into the effect of refractive surgery on visual function and performance. The perceived enhanced capabilities and readiness, as well as improved quality of life, seem to further substantiate the safety and efficacy of refractive surgery, particularly for individuals in the armed forces. For this patient population, it is not unreasonable to think that the gains from spectacle independence through refractive surgery are not only confidence and morale boosters but also a significant operational and, more importantly, survival advantage. The benefits associated with refractive surgery might be applicable to other patient cohorts such as law enforcement and firefighters, whose occupations may also be associated with various visually demanding tasks. Hays RD, Spritzer KL. National Eye Institute Refractive Error Quality of Life Instrument (NEI-RQL-42), Version 1.0: A Manual for Scoring and Use. Los Angeles: Rand Health Sciences; February2002. Lee HK, Choe CM, Ma KT, Kim EK. Measurement of contrast sensitivity and glare under mesopic and photopic conditions following wavefront-guided and conventional LASIK surgery. J Refract Surg. 2006;22:647–655. From the Warfighter Refractive Eye Surgery Program and Research Center at Fort Belvoir, Fort Belvoir, Virginia.